kelbysews: Who loves me the most? Yep, I found more hard-to-find stuff. Isn't it pretty? I don't think I need to say more. Dont forget to tell me which fabric you want to swap with me, I posted a pic for you on flickr. 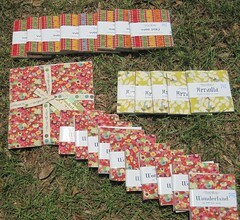 I would love to get 1 each of the arcadia & wonderland charm packs. where are they listed?